Preheat oven to 375 F. Brush 2 baking sheets with oil; set aside. In a wide, shallow bowl, whisk together eggs and 2 tablespoons water. In another wide, shallow bowl, combine breadcrumbs, 3/4 cup Parmesan, oregano, and basil; season with salt and pepper. Dip eggplant slices in egg mixture, then cover with breadcrumb mixture; place on baking sheets. Bake until golden brown on bottom, 20 to 25 minutes. Turn slices; continue baking until browned on other side, 20 to 25 minutes more. Remove from oven; raise oven heat to 400 F.
Spread 2 cups sauce in a 9 x 13 baking dish. Arrange half the eggplant in dish; cover with 2 cups sauce, then 1/2 cup mozzarella. Repeat with remaining eggplant, sauce, and mozzarella; sprinkle with remaining 2 tablespoons Parmesan. 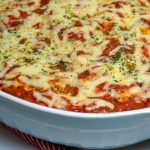 Bake until sauce is bubbling and cheese is melted, 15 to 20 minutes. Let stand 5 minutes before serving. Our Lord is not limited or frustrated by evil surroundings. He can make His voice heard. He can accomplish His will, even through people who are not living a life of obedience.